I had a wonderful omelet last month, at the Twisted Olive in Petosky. Fluffy, moist, rich. And I decided this was the year of the omelet. A few summers ago I decided to learn how to grill a better steak. And I succeeded. My sons say they wish I had learned before they left home. I read several articles on the kind of cuts, the process of air-drying, the temperature of the pan. It turned out that the reduction of heat after the steak is seared is critical. And the quality of the steak, as well. Frankly I buy cuts of meat I couldn’t afford when I had four kids at home. But now I can grill a steak better, more consistently. And this year I’m going to learn to do omelets right. I’ve fixed omelets three times in the last week. You have to have good ingredients, or course. We buy farm fresh eggs and I’ve been thinking more about the quality of the cheese and the freshness of the chives, things like that. 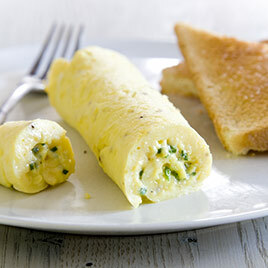 For now I’m working with a recipe from the American Test Kitchen for French omelets. This involves preheating and reheating the pan, grating frozen butter, stirring with chopsticks instead of a fork. It’s fun, and a lot faster than it sounds. But I can’t turn it out in a perfect roll. Yet. And mine is not as fluffy or moist as the ideal I’m trying to achieve. In other words, it doesn’t look like the picture. I think every recipe is like that. And I don’t mean just the ones that involve food. We have a picture in our head, someone tells us the exact steps to take, and the result isn’t quite what we imagined. We turned down the heat too soon, or we stirred the eggs too long. Practice helps. I’ve not turned out as many omelets as the bistro chef at the Twisted Olive. But I’ve not raised enough kids to get that exactly right, either— despite all the recipes my mother and my well-meaning friends had for my success. So it’s the year of the omelet. Offer suggestions. Invite yourself over if you are comfortable with imperfection. I’m still trying to understand the difference between gruyere and gouda. I have so much to learn, although fluffy and moist seem within my reach. A little-known trick is to put a small amount of pancake batter in with the eggs. It helps with the fluffy. Where did you learn this? Good idea.